Looking up at the adapted tower. Driving down Sunset Boulevard between Dodger Stadium and Downtown Los Angeles, drivers have long looked up at an empty, concrete-framed building that thrusts its hulking mass above the streetscape. 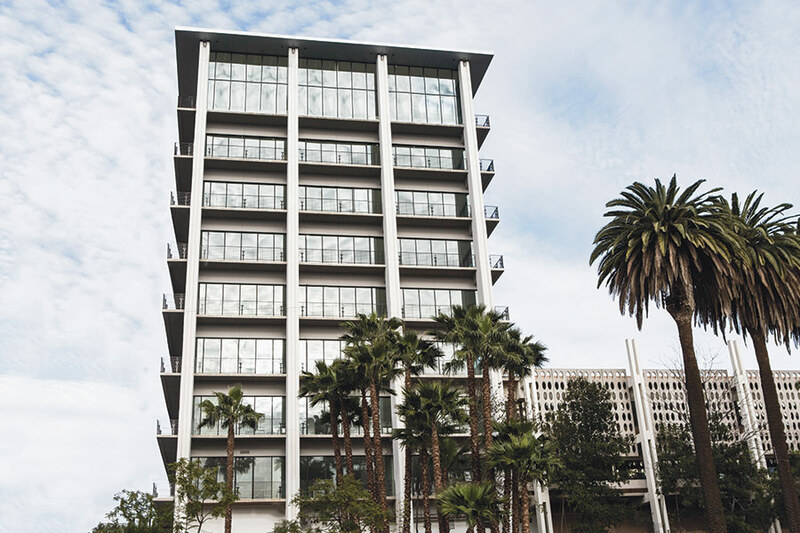 It turns out that the structure was a long-forgotten gem, left vacant for about 20 years—the Metropolitan Water District (MWD) Headquarters by LA architectural pioneer William Pereira. The structure has now been given new life as an apartment tower. The long hiatus started when MWD moved out in 1994, selling the property to the Holy Hill Community Church. After adding a new sanctuary and destroying part of the original building, Holy Hill became mired in internal battles and lawsuits. A subsequent buyer hoped to revive the building in 2009, but was foiled by the economic downturn. The new owner, Linear City, bought the property in 2011. “It looked like Beirut,” said Linear City partner Leonard Hill of the vacant building, which was full of pigeons, dirt, and other surprises. Inside an upper floor unit (left). 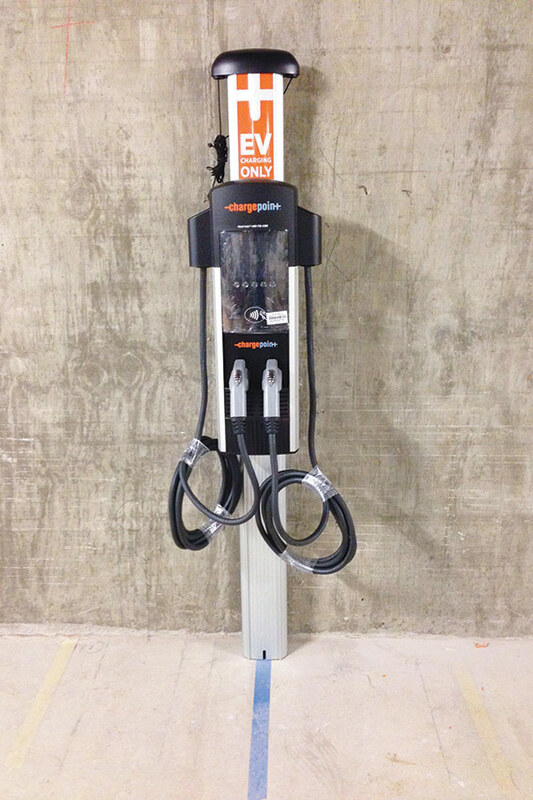 An electric vehicle charging station (right). The new 96-unit project, called the Elysian, preserves many of the Pereira building’s original elements—including exposed, uninterrupted exterior columns and beams, and travertine tile entry details—while making several energy efficiency upgrades, like a solar thermal system, double pane windows with Low E Glass, LED Lighting, and electric car charging stations. David Lawrence Gray Architects led the project and Studio Hus designed the interiors. 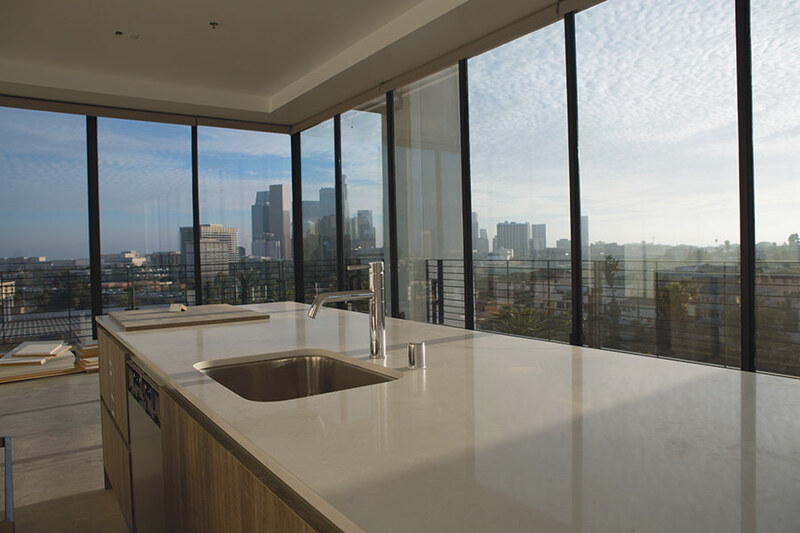 The open-planned units feature balconies, polished concrete (or in some cases bamboo) floors, and floor-to-ceiling windows, not to mention panoramic views of downtown, Echo Park, and elsewhere. The building also houses a first floor restaurant (yet to be filled at press time) and contains an outdoor deck, designed by Ilan Dei Studio. “For a stodgy agency, MWD made a bold move hiring Pereira,” noted Hill, of the original building’s unique design. Some of the original elements—like wrap-around balconies and a top floor machine room (replaced by 14 penthouses topped by a new metal wing roof)—have been changed. But Linear City, which also redeveloped the Toy Company Lofts, Biscuit Company Lofts, and 7+ Bridge in the city’s Arts District, focused on leaving many of the original details intact.